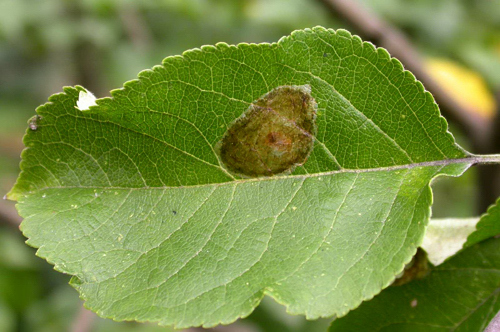 The mine begins as an inconspicuous epidermal corridor, mainly recognisable by its reddish brown frass line. 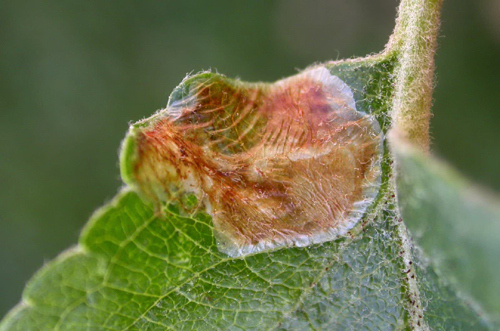 In the next instar a blotch is formed. The mine is not starting over a vein, rather lies between two veins. The colour initially is silvery, but soon the mine gets a characteristic orange-brown tinge. Usually, but by no means invariably, the mine is upper-surface; lower-surface mines keep their original silvery colour. Silk is deposited within the mine, but in little quantities and the mine contracts only lightly. The mine hardly contains any frass. 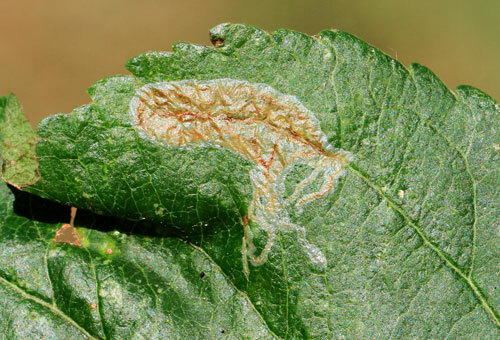 After some time the larva leaves the mine and then lives free in a leaf margin that has been folded downwards and fixed with silk. 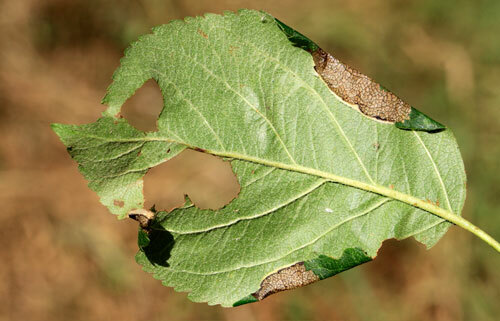 Two such folds are usually made, and eaten out to the upper epidermis. Cotoneaster; Crataegus; Malus baccata, domestica, floribunda, fusca, pumila, x purpurea, ringo, “Royalty”, sylvestris; Pyrus astracanica, communis. References from other plants than Apple are so scant that conceivably they refer to cases of xenophagy. Larvae in July – August (Emmet ao, 1985a). Europe, except the Balkan Peninsula and the Mediterranean Islands (Fauna Europaea, 2009). See Patočka (2001b), Patočka & Turčáni (2005a). 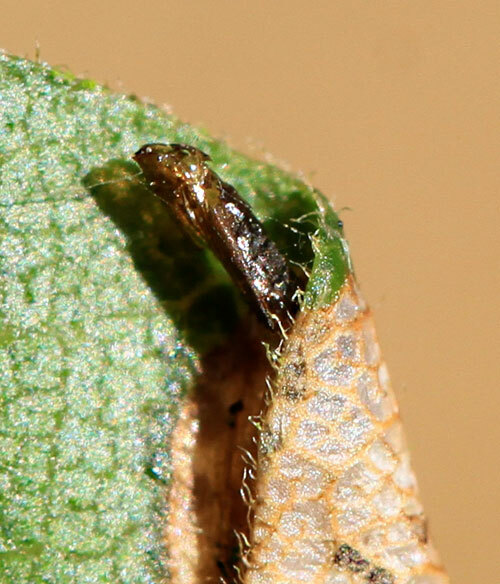 The mine strongly resembles the one of Parornix petiolella; however, in that species the free living larva lives in a leaf margin that has been folded upwards (Hering, 1957a). 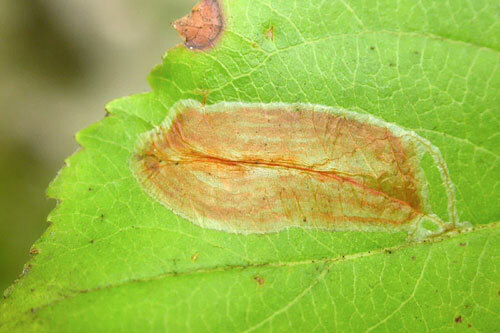 Mines can also be confused with those of Phyllonorycter corylifioliella. These always lie on over a vein, are silvery, and the epidermis is speckled with drops of frass. Beiger (1979a), Bengtsson & Johansson (2011a), Biesenbaum (2010a), Buhr (1935b), Buszko (1992b), Buszko & Baraniak (1987a), Buszko & Beshkov (2004a), Deutschmann (2008a), Drăghia (1970a), Emmet, Watkinson & Wilson (1985a), van Frankenhuyzen & Freriks (1975b, 1983a), van Frankenhuyzen & Houtman (1972a), van Frankenhuyzen Houtman & Kabos (1982a), Haase (1942a), Hartig (1939a), Hering (1932g, 1957a), Huber (1969a), Huemer (1988a), Huemer & Erlebach (2003a), Jaworski (2009a), Klimesch (1950c), Kuchlein & Donner (1993a), Kuchlein & de Vos (1999a), Maček (1999a), Nowakowski (1954a), Patočka (2001b), Patočka & Turčáni (2005a), De Prins (1998a, 2010a), Robbins (1991a), Schütze (1931a), Sefrová (2005a), Skala (1941a, 1951a), Sønderup (1949a), Stammer (2016a), Starý (1930a), Szőcs (1977a, 1981a), Zoerner (1969a, 1970a).